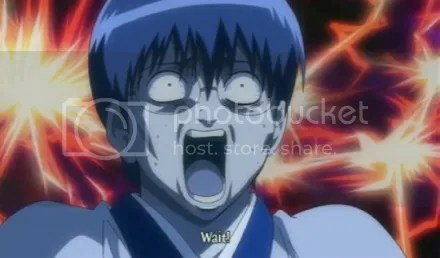 Gintama Episode 202: what happened? Lol, I love the reference to One Piece. All the characters went through drastic changes except for Shinpachi. Right away, it’s already clear that Shinpachi is the one who’s not normal, hah. 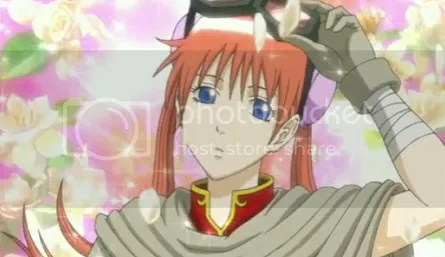 What ever happened to the cute little annoying Kagura? She’s all grown up now… too grown. NOOO, NOT YOU TOO, SADAHARU. why? why must Sadaharu change? He was soooo cute as a dog. T-T Not enjoying the old man version of Sadaharu. 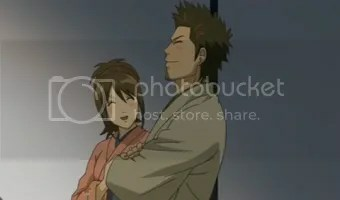 In just two years, Otae and Kondo fell in love and got married. So in that amount of time, he moved from Stalker Status to being her lover? WAAAHHH?. Yayy, Kyuubei. She’s looks so adorable but here’s the catch: in exchange for an adorable outward appearance, she’s actually a man on the inside. A true man, if you know what I mean. Physically a man now. hah. 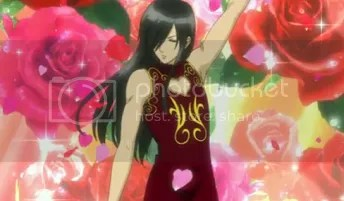 So Kyuubei goes from being a girl to a real man and Katsura goes from being a man to a lady, nice. 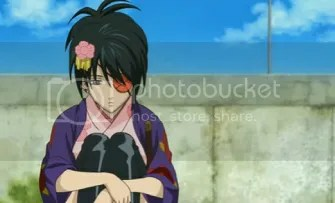 Afterthoughts: WHAT HAPPENED TO EVERYONE, except for Shinpachi. 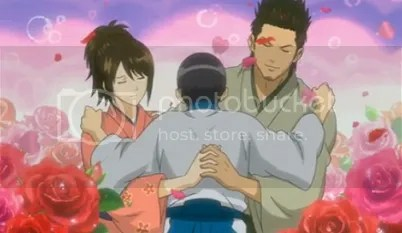 I must say, it was refreshing to watch some Gintama after it ended about a year ago, I think. The OP and ED are good or at least by my standards they are. I love how serious the ED is, showing how Gintama has its serious moments and that it’s not just about fun and parodies. There’s not much to say about it right now as Gintama is just being Gintama. It’s just too awesome but I can’t wait for the serious stuff. 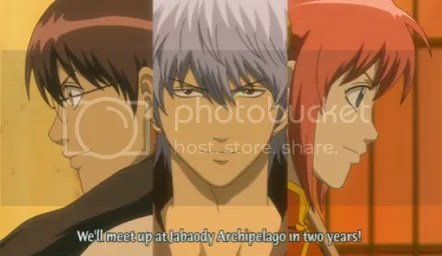 This entry was posted in Anime, Gintama' and tagged anime, gintama. Bookmark the permalink. Also I like that about the ending theme as well, especially the arc it means we’ll be getting soon. I think the scope of it will pretty much overshadow just about all of the ones we’ve seen before, and while Jiraia pissed Gintoki off, Jirochou will make him snap. I would miss how the characters used to look. I don’t think I could handle it if Kagura took the leading role. 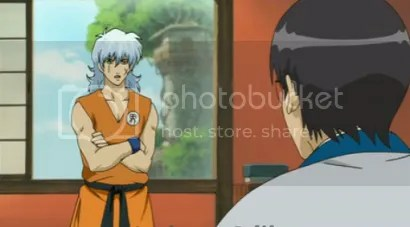 Gintama=Gintoki . So for me, Gintoki bascially embodied all of what Gintama is and without him or his role as the main protagonist, it just wouldn’t be the same anymore. This ending seems to be a lot more ‘dark themed’ than the previous ones. Has Jirochou shown up in the anime yet? There have been some series where they do change the protagonist like this, but I’ll have to agree with you a bit on that. While time skip Kagura could have made for a fun protagonist, Gintoki still has quite a few things to do before something like that could happen (like at least taking down Takasugi), and even then Sorachi is probably more likely to go on and write something else. Which wouldn’t really be a problem, his one shots, Dandelion, 13, and Bankara were all amazing and if anything I’d love to see him continue 13. It kind of reminds me of the 12th ending theme from around the Yoshiwara arc, but if there’s one thing that stands it, it’s that among everyone and everything that’s shown, Otose isn’t there. So maybe that’s what adds that extra weight to it. Jirochou is one of the four heads alongside Otose and Saigou, so while he most likely hasn’t made an appearance yet, he’s probably been mentioned before. It’s clear that Gintama has no intention of changing the characters’ appearances since Gintoki got out of his disguise, I think. I haven’t been able to read any of his one shots except for Bankara and I would love to see him continue it. Yeah, it’s probably her missing presence that makes it different. 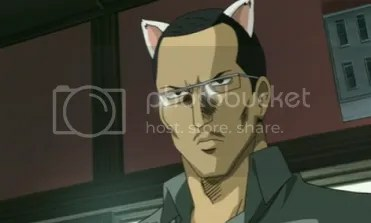 Ah, Gintama, just as crazy as ever. It’s only April, but I’m going to go ahead a call this the best series of the year.